The Teak House as the name suggests is built entirely out of Sri Lankan teak wood, a hardwood that is sustainable and beautiful at the same time. This hilltop villa is located on the southern coast of Sri Lanka. Walking distance to the beach, this two-bedroom property will serve as the most romantic and scenic getaway for couples, friends, and small families. With a newly-built 12-metre swimming pool that not only invites you for a refresher but also provides a breather under the tropical sun. There are two, well-lit bedrooms at The Teak House with four-poster king-sized beds saved from mosquitoes with canopies that have sheer, white drapes for a comforting and soothing atmosphere. There are daybeds at the foot of the beds for lounging about and the cool ambiance afforded to the rooms because of the teak wood walls and floors creates a nice space that you can retire to at night. There are large wooden windows that open out to the gardens for fresh air and even fresher views. En-suite bathrooms feature cement walls, showers with hot and cold water, and other necessities. Surrounded by dense forestry and lush foliage is the 12-metre swimming pool at The Teak House that is fringed by towering palm trees making this a perfect oasis and a great way to spend your mornings and afternoons easily laying back and floating under the cloudless sky. The gardens have been manicured and the morning dew still fresh on the grass is the only invitation you need to lie down and breathe in the fresh air. You can even take your breakfast outside as this is your home for the next few days and all you need to do is be comfortable. With the entire house built out of teak wood, it adds a rustic and cool atmosphere to the entire property making it especially cosy and incredibly homely for guests. While you’re lounging on the wicker furniture found in the open-plan living area, you will find yourself gazing outdoors at the beauty of the gardens that draws in a flock of tropical birds chirping and bringing the garden to life. The all-wood interiors are offset by vibrant cushions in shades of green, orange, and pink. There is a four-seater dining table made with the wicker technique as well that forms a complete and wholesome vibe where guests can enjoy precious moments with friends and family. You can hire the services of personal chef who will delight you with excellent local food to keep you happy and sated. There is a study/ lounge with a music player, writing desk, etc. for work and relaxation. The Teak House provides housekeeping and other services to guests so that your needs are met and catered to. For dining purposes, the chef uses all fresh produce, locally-sourced for the freshest meals available on request. Special requests such as laundry and massages are available for an additional cost. 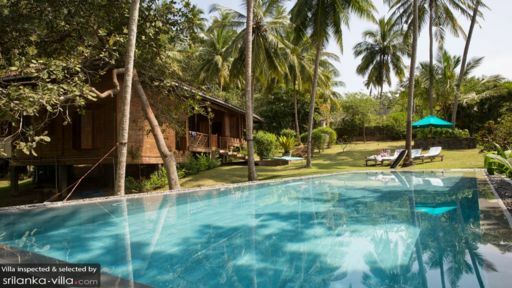 A few kilometres from Tangalle, The Teak House is found at an idyllic hilltop location with sprawling views across the ocean. There is much to do nearby including whale watching, dolphin watching, and visiting turtle hatcheries. Sri Lanka is famous for its national parks like Yala National Park and it would be an excellent way to interact with wildlife. we chose The teak House to relax after a fortnight of touring Sri Lanka, and are heartily glad we did so. The house is a pretty wooden construction in delightful grounds with a new and delightful pool. The open living area and bedrooms are attractive and comfortable; whether sitting watching wildlife and bird life by the pool or, later in the evening, counting the numerous fireflies which flock around, the place is enchanting. What makes the place really special is the attention and kindness of the people. Roshan and his brother Ruane keep everything is tip top trim and serve the most delicious meals entirely unintrusively. Ruane will take you out in his tuk tuk to places you'd never find without local knowledge, and if you wish to go further afield, the property's favoured driver, Sujith, is simply the most wonderful guide to the local attractions and wildlife. In fact, anyone contemplating a tour of Sri Lanka should DM me for Sujith's telephone number, because he is an absolute gem. The legendary Tissa the dog will accompany you on the short stroll to the beach where you can watch the fishermen bring in their catch - it's a truly magical place. The shower's good and powerful, as well. Heartily recommended, we'll be back. what a wonderful house! We spent a week in this very peaceful property up on the hill, 2 mins walk to one of the most picturesque beaches in the area. The villa has 2 double rooms with lovely 4 poster beds, interconnected by an open living/dining area. The villa is managed by the superb Roshan who is an outstanding cook, as well as his brother Ruane who has a Tuk Tuk to take you wherever you fancy. Not forgetting Tissa and Seeni who are a lovely addition to the property. Beach is fab for boogie boarding and long walks, and lots of rock pools which the kids enjoyed! the lovely new pool is also a very welcome addition, adding to the appeal of the house. You sleep at night with the roar of the ocean below and the noise of the jungle. 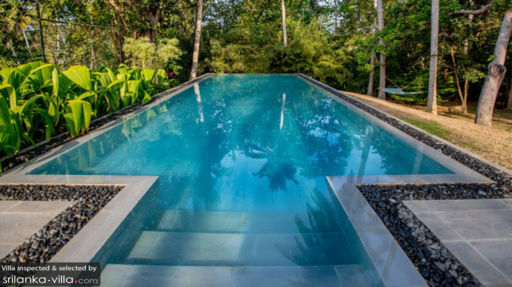 Well located, close to the Aman and Tangalle. would 100% recommend a stay here. My wife and I stayed two weeks at The Teak House in October 2013. We were advised that it was second monsoon season and that we might encounter a great deal of rain, but the weather was nearly perfect during our visit. Brief afternoon showers fell on some days and we did have about 24 hours of continuous rain soon after we arrived, but otherwise it was sunny and warm. 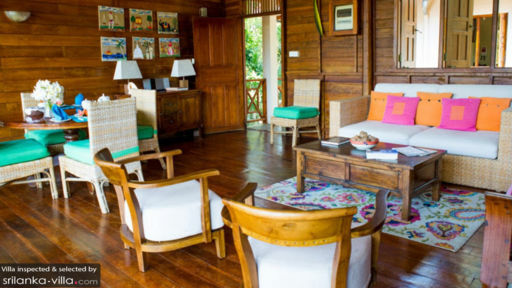 We recently spent 10 nights at Teak House. We were looking for a break from a very hectic and stressful lifestyle that took us back to grass roots with just the right amount of luxury. And that is exactly what we go. My Wife and I stayed in the Teak House for 5 nights in December 2012 and we had the best time ever!!! The House is even prettier than the pictures we saw online. Clean, Spacious and very quiet. It is a 2 mins walk to a beautiful and quiet Beach. Roshan and his brother Ruanne made the experience even better. Roshan cooked amazing dishes to us all week and even made a huge Birthday cake for me... Ruanne took us in his Tuk Tuk to some beautiful places around town, places we would have never found or heard about on our own. We will definitely come back next Year and will recommend this house to our friends. Thank you Teak House Team!! !